To address the racial-ethnic opportunity gaps in higher education, CUE’s research strategy draws upon a broad range of theoretical frameworks, then grounds them in proven principles of institutional change, and applies them through participatory action research and the change process. Cultural historical activity theory, which integrates the theories of learning with the historical context of racial discrimination in our society. 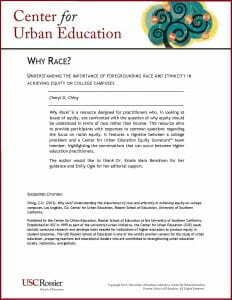 CUE has published research on the organizational change process, as well as a range of topics related to equity. Click the links to the right to view the published results of our work.